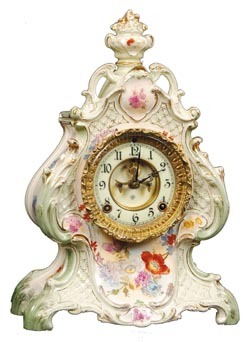 Ansonia Clock Co., Royal Bonn, "LaClair", ca 1901. This is a very rare model according to the Millers. It is 15" high, 11" wide. The case is primarily white with almost half being a very light green around the edges. There is also a nice amount of gold trim, and flowers of blue and red, and shades in between. A most unusual case not only because of the open space and knob on top, but the latticework over the front. Ly-Ansonia No. 2705.